Building muscle is a very demanding activity that requires discipline and strength. Not only do you need to have a good exercise routine, but you also have to eat well, as well as need to get the right amount of rest. Fortunately, there are things that you can do to help build the muscles maximally. Among the best things you can do is consume protein shakes such as the Body Fortress Super Advanced Mass Gainer. It is no secret that protein shakes can do wonders in helping you gain muscle mass. So, let’s take a look at this whey protein powder and what it can do for you and your body. This is a 2.25-pound jar of protein powder that is available in chocolate and vanilla flavors. As such, to make a protein shake, all you need is to mix it with water. In order to help sustain the increased muscle glycogen, the components of the product supply the body with an excess of calories. They also help flood the muscles with amino acids to build lean mass and assist in regeneration during recovery. Two scoops of the powder have been formulated to provide more than 1,000 mass-building calories. The good thing is that the powder mix provides more than just calories. Per six-scoop serving, it provides 40 grams of protein. Similarly, the right amount of carbs (198 grams) that can help replenish muscles and boost workout recovery is provided per serving or three scoops. You also get eight grams of BCAA’s (branched-chain amino acids). To consume the product, mix one serving or three scoops, with 12 ounces of water after each workout. If you want to build muscle maximally, mix six scoops or two servings with 20 to 24 ounces of water. Do note that the amount of water used can be adjusted accordingly to meet each person’s preference in the consistency of the drink. The drink can be prepared by stirring, shaking, or using a blender. When it comes to blending, blend the mixture for about 20 to 30 seconds until mixed thoroughly. Do note that the drink is not designed to cure and/or prevent any disease and it is to only be used as a nutritional supplement to boost protein and caloric intake. The drink should be used along with a daily exercise program and a balanced diet that includes proper calorie intake for the best results. Also, this is a post-workout protein powder, so you need to consume it after your gym or exercise session. The whey protein drink does not have any aspartame and gluten. It contains a protein matrix that includes milk protein concentrate, maltodextrin, whey protein concentrate, calcium caseinate, and whey protein isolate. It also has cocoa (for chocolate) that is processed with non-dairy, sunflower oil-based creamer, alkali, mono and diglycerides, fructose, natural tocopherols, tricalcium phosphate, soy lecithin, sunflower oil, xanthan gum, sucralose, acesulfame potassium, and flavoring (artificial and natural). The drink also has a simple flavor, which means that there is no any aftertaste or additional flavors to mask the calorie and protein components. The Body Fortress Super Advanced Mass Gainer is formulated to provide the user's body with all the calories, proteins, and carbs that you will need after your workout. It provides over 1,000 calories for mass building and 2.5 grams of Betapower Betaine for lean mass. The powder also has 40 grams of protein, 198 grams of carbs, as well as a high concentration of naturally occurring BCAA’s per serving or three scoops. The drink is free from gluten and aspartame. It is available in simple chocolate or vanilla flavor, and it can be mixed, blended, or shaken with water. Although it mixes well with room-temperature water, it might become clumpy, or some residue of the powder may be stuck on the bottom of the glass or water bottle where you prepared it. In order to see if this is really the protein powder for you, we compared it with two other protein supplements. We first compare the Body Fortress Super Advanced Mass Gainer with the Naturade Weight Gain Instant Nutrition Drink Mix. Both powder drinks provide all-natural ingredients that help amplify the caloric intake. They also provide additional carbs and protein with each serving, as well as available in chocolate and vanilla flavors. The Naturade drink has one advantage in that it provides more calories per serving, and it is a more affordable product. That being said, the Body Fortress Super Advanced Mass Gainer actually has more supplements and ingredients to help in building muscles. While the cost is more than the Naturade powder, you will also gain more benefits and nutritional value. The Naturade also lacks most of the key nutrients needed to optimize muscle building. Next, we compared the Body Fortress Super Advanced Mass Gainer with the Muscle Milk Gainer Protein Powder. Like the previous comparison, both powder drinks contain all-natural ingredients that help amplify the caloric intake through protein supplements. They also essentially offer the same quality ingredients for a whey protein shake. Additionally, both provide additional carbs with each serving, as well as provide advanced nutrients and supplements to make the most of the bodybuilding. The Muscle Milk Gainer Protein Powder has an advantage in that it can be drunk as a pre-workout drink or anytime you need a protein boost, while the Body Fortress is marketed primarily as a post-workout drink. Unfortunately, it is more expensive than the Body Fortress and is only available in chocolate flavor. 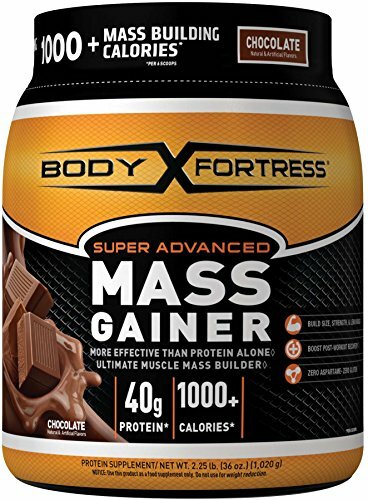 The Body Fortress Super Advanced Mass Gainer also provides more servings with its contents compared to the Muscle Milk Gainer Protein Powder. The Body Fortress Super Advanced Mass Gainer is one of the best products that you can get if you are looking for a good post-workout drink. It provides your body with the right amount of calories, proteins, and other supplements that you need to make the most of your bodybuilding routine. It helps your body recover from your workout, promoting proper recovery. However, as similar to any other supplements, it works best with a bodybuilding program and a healthy diet. Nonetheless, it helps in building more muscle safely and naturally. Overall, when compared with other products, the Body Fortress Super Advanced Mass Gainer provides more supplements, while still being affordable. Thus, you get great value for your money!